Sweet, plump, briny and ready in minutes—is there a more elegant dinner than a pot of fragrant steamed mussels and a baton of bread? While mussels may not get as much of the limelight as oysters, they are a classic crowdpleaser, perfect for seafood newbies and aficionados alike. Previously, we wrote about growing mussels in Prince Edward Island, off the Atlantic coast. 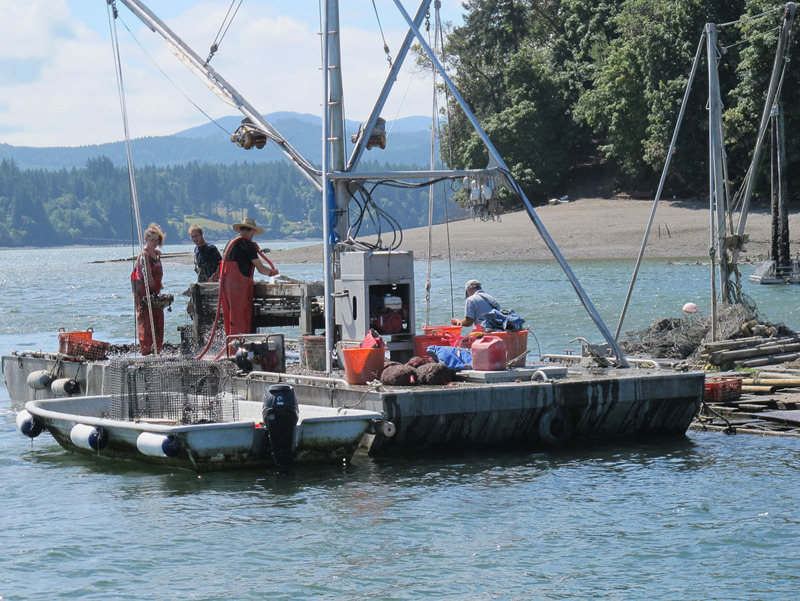 On a recent trip to Taylor Shellfish Farms, I was excited to finally see firsthand how mussel lines operate on the West Coast. 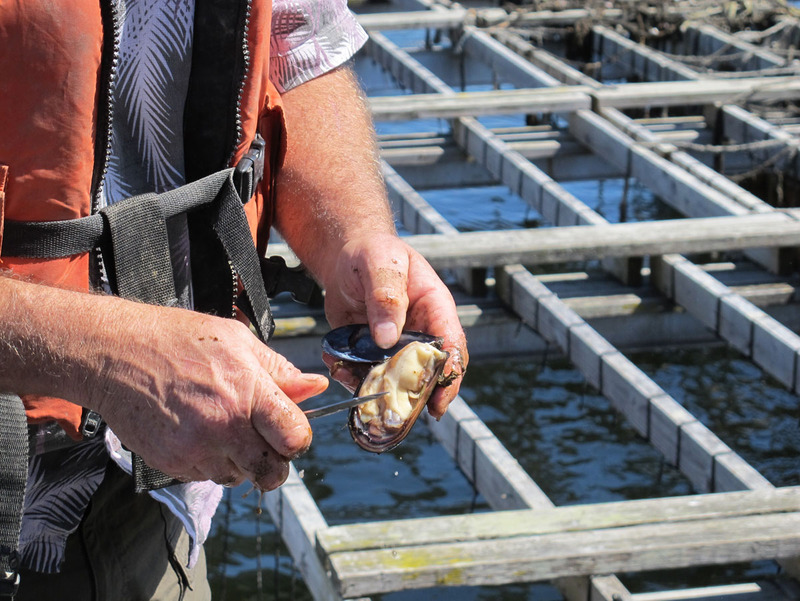 The shallow inlets and bays of Washington’s Puget Sound carry nutrient-rich water, which results in fast-growing mussels with clean flavors. Taylor Shellfish specializes in Mediterranean mussels, which are larger than standard blue mussels found on the East Coast. They are also reverse spawners, meaning they spawn in winter, while other mussels and shellfish spawn in summer. That means Mediterranean mussels are plump and at their peak flavor during warm months, when blue mussels tend to be thin and spawning. 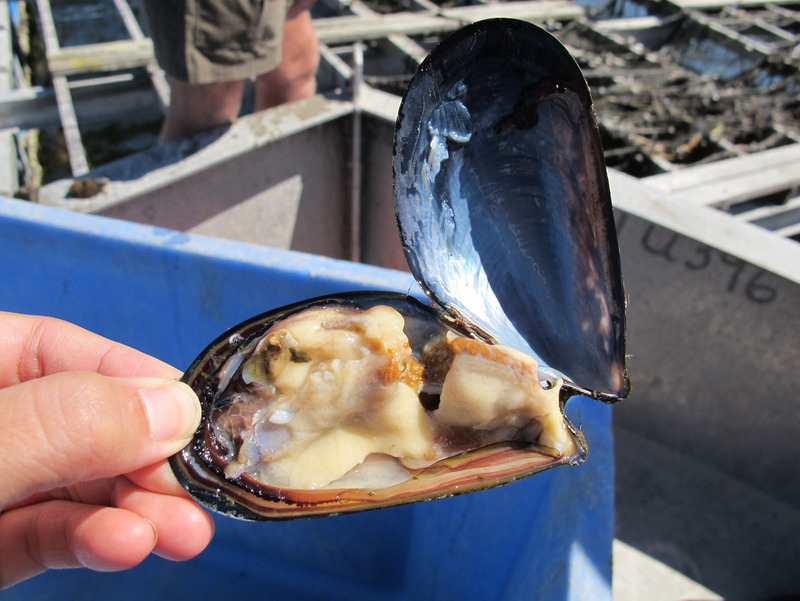 To grow mussels, seed is stuffed in long mesh tubes called “socks,” similar to the way sausage is put into casings. 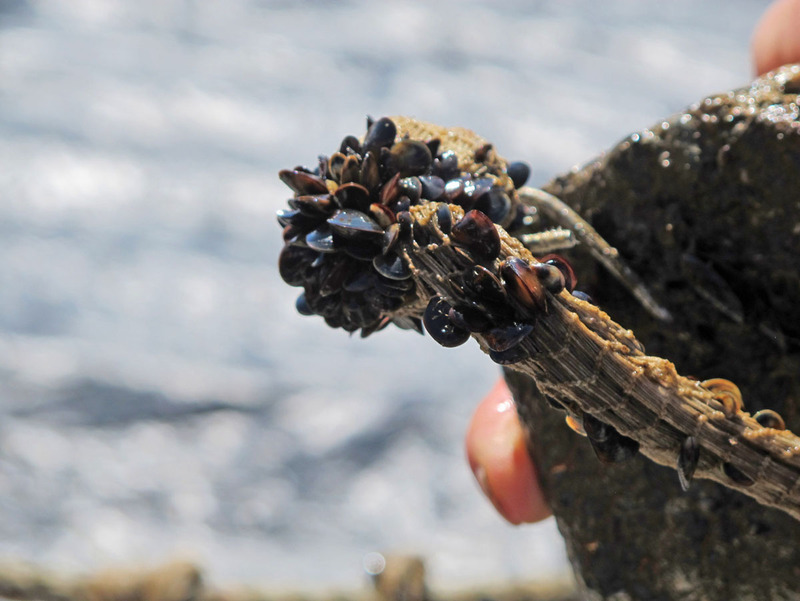 Unlike oysters, mussels can move by contracting their byssal threads or “beards.” So, although the seed starts out on the inside of the sock, it will migrate to the outside of the sock as it grows, leaving a thin rope in the center of the mussel column. The lines are hung from floating rafts anchored in deep water. This way, the mussels have access to the best food in the water column and never touch the muddy bottom of the bay. We pulled one mature mussel off a line and shucked it open. Inside the mussel’s belly, you can see the reddish algae that it recently ingested. Looks like a solid lunch! The mussels will later be purged after harvesting, so that the meats are clean. 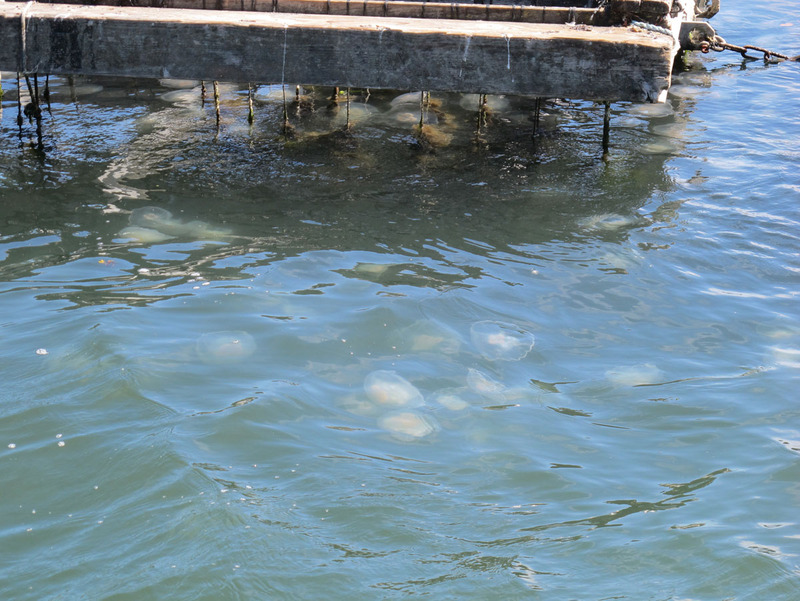 These waters are so fertile that jellyfish, sponges and other sea creatures tend to gather near the mussel rafts. 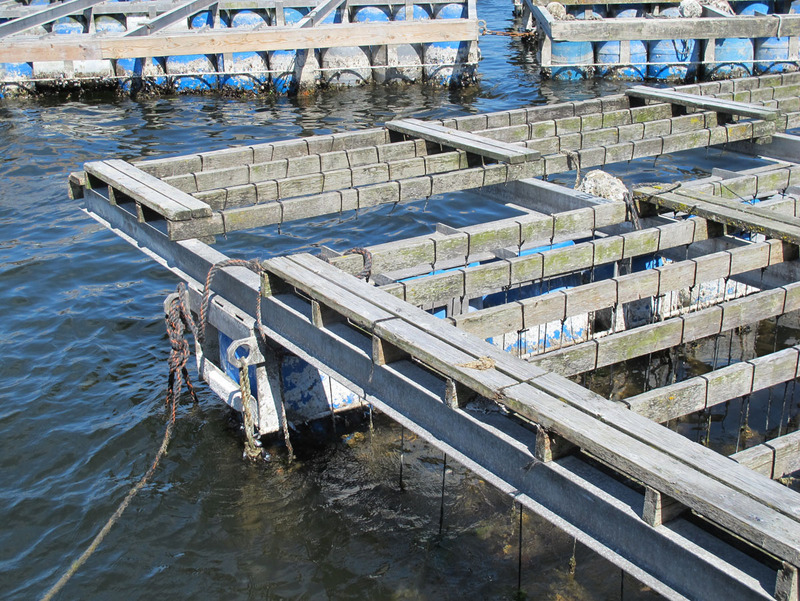 When it comes time to harvest the mussels, they will be removed from their lines and placed in large bins. At this point, the mussels are pretty dirty, but soon they’ll be brought to the processing plant for washing and bagging. In the next post, we will check out the Taylor Shellfish processing plant and see how products are prepared for shipping around the world!